Edinburgh's dining scene is renowned for its innovation. While you're in town treat your taste buds to a lavish dining experience at the hands of the capital's most exciting chefs. Aizle practises the art of 'bistronomie' – Parisian for bistro plus gastronomy. A blackboard lists this month's 'harvest', and that will get you googling. Then comes the parade, each dish an Instagrammable picture for a postmodern exhibition. Highlights include a caviar-dribbled, samphire-dressed turbot on Arran Victory potato purée. Whatever Aizle calls its art, it's tempting to call it a masterpiece. One of the city's most sophisticated restaurants, where beautiful food is presented with class and creativity. The extensive a la carte mains include a choice of land and sea but it's hard to see past paella Castle Terrace style, packed full of fishy delicacies from a tasty octopus morsel to squid, salmon and monkfish. Equally impressive is a caramel soufflé dessert. The £29.50 lunch menu is both excellent and excellent value. A decade of running this eponymous restaurant has brought Tom Kitchin celebrity status and a Michelin star. He remains unwaveringly committed to showcasing Scotland's finest produce and diners are presented with a map tracing the provenance of ingredients. Mains feature stunningly presented hare pithivier, golden pastry encasing rich meat, served with pumpkin sauce. Among the technically accomplished desserts is feather-light apple crumble soufflé. Fresh fish and fine seafood of this quality are hard to come by. 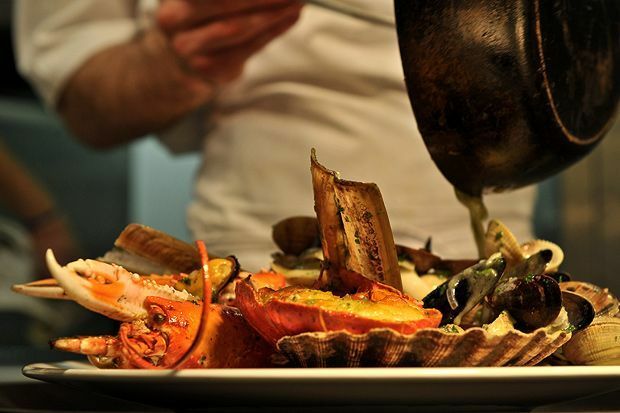 A chunky fillet of pan-fired sea bass is flaky to the fork, seared Isle of Mull scallops shine, served in their shells, while a bowl of grilled Tarbert langoustines is marvellously multi-sensory and satisfyingly strenuous to eat. The imaginative wine list contains some unusual options, non-fish-eaters are well catered for and the friendly, efficient team makes the whole enterprise seem effortless. An institution of the Edinburgh fine dining scene. The vibe is one of consummate professionalism from the moment you step in off the cobbled street. There are stunning treats in store, especially if you take the plunge and try the six course tasting menu. Roast quail is pink, succulent and delicate, accompanied by a texture corn purée, and just outshone by a roast duck breast and crisp pastille off duck.